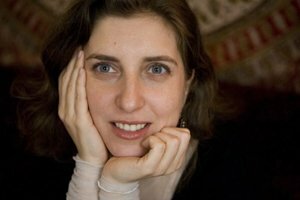 Joana Hadjithomas is back in the director's chair with new documentary The Lebanese Rocket Society - a film that tells a part of Lebanese history that has been forgotten over the years. The movie played at the Bird Eye View Festival in London last week - where it was very well received - and we caught up with the director to chat about the movie and the inspiration behind it. - The Lebanese Rocket Society is your new movie so can you tell me a little bit about the film? The film is a feature film documentary and we began working on it three years ago. But we had the desire to do a film around the rocket society around 2001 because we saw a really strange image of a rocket bearing the colours of the Lebanese flag on a stamp and we were very surprised by this and wanted to know more. Doing a project about space and science in the region was very new for us and it was very strange that we had never heard about this story. So wanting to know more was the beginning of the adventure of the project. It is about a space project that was in Lebanon in the sixties and began in a small university. It follows a mathematic professor Manoug Manogian and students who begin working on rockets; they begin with small rockets and little by little they improved a lot in the building of the rockets and they launched bigger and bigger rockets that went far and fast. It stopped suddenly in 1967 for a lot of reasons that you can see in the film. What we really liked about it was when we met all of these people we had the feeling that they were dreamers and we needed dreams and dreamers today. - As you say it is a story that not a lot of people know about - not just outside Lebanon but inside as well - so where did this movie start from you? And how did you start planning on how to put this movie together? The fact that a lot of people didn't know about the story - in fact we can say that nearly on one in the country knew abut the rocket project - was really interesting to Khalil Joreige and myself because while this event is totally absent today it was really present in the sixties - it was everywhere in newspapers, it was launched on Independence Day and there are stamps. So the fact that this was forgotten it something that really interested us a lot. So when we started the film we began by doing a lot of research and, at the beginning, we thought that we would not be able to find a lot of documents; we found very few images, a short three minute film and some newspaper clippings but we didn't really find other images. So we started doing interviews and meeting people who were part of this rocket society and it was only when we met Manoug Manogian that he revealed his treasure. He had films, images he had the whole project and he was able to tell us the story. So little by little the story appeared. While we thought that we were going to do a film of the missing images and a missing stories suddenly we had the whole story, and it was really important to us to tell the story. - You have slightly touched on my next question really as you say Manoug Manogian was crucial to the making of the film because of all of the assets that he had from that period. So how useful was all that for you in the development of the film? And how keen was he to come forward and tell his story? At the beginning he wanted to know all about intentions and why all of a sudden two people, coming from Beirut, want to make a film after all these years when on one has every asked him anything about it. He wanted to really understand our motivations and once he saw that we were totally interesting in this event he trusted us. He then opened up and told us his story. It was always very important for him to always tell us that it was a scientific project for all of them, even if the army had other intentions, for them it was a space project that felt contemporary to the rest of the world and linked to the research of that time. - When you came across all of the photographs, information and film that Manoug had how did that change the direction of the film? At the beginning we thought that we were going to be telling a story without images and so we wanted to use animation to compensate this absence. So we were going to draw all of these images and launches of the rockets to go with the small amount of film that we had. But when we got this very nice archive of images and film we thought that we would use the animation, but in a different way. Little by little we had this feeling that we were telling a story that was very important to tell but we had to say that it was a story of dreamers and today we can continue this gesture. So we really wanted to do something that was a tribute to those dreamers and to this story and this is how we entered into the phase of doing a structure of the rocket that we first saw on the stamp. The animation allowed us to have a past, a present and a future as we could show that if Lebanon the space programme what could have happened. - You were piecing this story together though the images and information that you came across but what challenges did you face as you were making the film? The editing was really hard. It we go back to the beginning of the work the first part that was hard was to understand if the project was really serious, what kind of project it was and to be able to find the people who were involved - we didn't know where many of them were - and to find all of the documents. It sort of turned into an investigation that took us a lot of time. So this part was really challenging but it was also very exciting as we kept fining different elements that helped complete the story little by little. The editing was really hard because we had to do a voice over as it was important not only to tell the story but also how it echoes today for us. We also had to put in context of the sixties to understand what it was about, the relation to space and how the region was during a period of Cold War. So to put all that in context of the time was tricky. - The film has been shown at the Birds Eye View Festival in London so how great has that experience been? And how have found the response to the film here in the UK and overseas? The film was shown here a few days a go and it was great because it was sold out and I felt that people were excited to see the film. The film raises some interesting questions about history and when we did the Q&A the questions were very much around that. In Lebanon the film is going to be released in a few days and the excitement is very different. But we have been touring with the film and we have the feeling that people really connect with the story, the moment and with the dream. It is a documentary that is treated in a different way as you have part of the film that are more like an investigatory documentary and then you suddenly you go to a part that is more artistic with the building of the sculpture and finally you have the animation. So that was the real challenge for us to create a different structure for a documentary. I was very happy to show it as it completes the journey. And now we are going to release it in the UK in September - a UK distributor has picked up the film. - Finally what is next for you? We will be touring a little but with the film. But we are about to start work on a new movie - it will be fiction this time around. So we are already thinking of something new but we want to protect this one and continue the journey with it.